Aircraft noise has been shown to be associated with cardiovascular disease and is considered as a novel vascular risk factor. In 2013, the research team of Professor Thomas Münzel has succeeded in proving that simulated night-flying noise increases the stress hormone adrenaline, reduces sleep quality and triggers a vascular damage called endothelial dysfunction. However, the molecular mechanisms of this vascular damage have not been established so far. In a newly developed animal model, the scientists have now been able to detect that aircraft noise leads to a significant increase in stress hormones, vascular dysfunction, increased oxidative stress and a marked change in the expression of genes within the vessel wall. They also decoded the enzymes responsible for vascular damage. The results of this study enable us for the first time to develop specific strategies, which may mitigate the negative consequences for the vasculature caused by noise. The scientists describe the study that was published in the European Heart Journal as a breakthrough in (aircraft) noise research. The results were presented at Johannes Gutenberg University Mainz (JGU). In this new study, the effects of two different noise scenarios on vascular function were tested. In one of the noise scenarios, mice were exposed to aircraft noise for four days, in the other for four days with ambient noise ("white noise"). The mean sound level was identical. 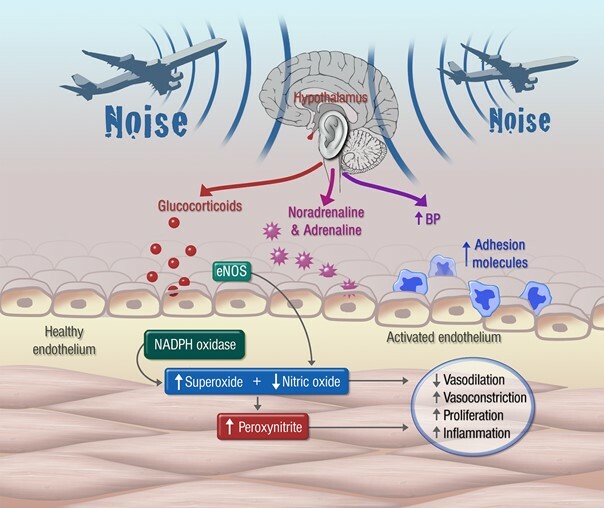 The working group established that similar to the effects of nighttime aircraft noise on vascular function in healthy subjects, noise triggered endothelial dysfunction within one day of exposure. This caused an increase of sensitivity to vasoconstrictor substances and an increase of stress hormone levels with the consequence of arterial hypertension. The aircraft noise induced vascular damage which was caused primarily by increased formation of free radicals. The research group identified two radical-forming enzymes: nicotinamide adenine dinucleotide phosphate oxidase (NADPH oxidase) and nitric oxide synthase (NOS). Interestingly, the same noise levels with ambient noise did not have any negativ effect on the vessels within four days. The group of Professor Erwin Schmidt from Johannes Gutenberg University Mainz (JGU) analyzed the effects of noise on gene regulation within the vessels. "The focus here was on the change in the regulation of genes responsible for the regulation of vessel tension, vessel wall structure and vascular cell death," said Schmidt. In the opinion of the research team Professor Thomas Münzel, Director of Cardiology I at the Center for Cardiology, Professor Andreas Daiber, Head of Molecular Cardiology at the Center for Cardiology of the Mainz University Medical Center, and Professor Erwin Schmidt, the results of the presented study represent a breakthrough in noise research. "Since traditional cardiovascular risk factors lead to vascular dysfunction through almost the same mechanisms, it is likely to expect that noise exaggerates already existing cardiovascular disease," concluded the three scientists from their results. "For the first time, it will also be possible to test to what extent cardiovascular pharmacotherapy can prevent aircraft noise-induced vascular damage. In addition, we will also examine the cardiovascular effects of road and rail noise in the near future," says Münzel. 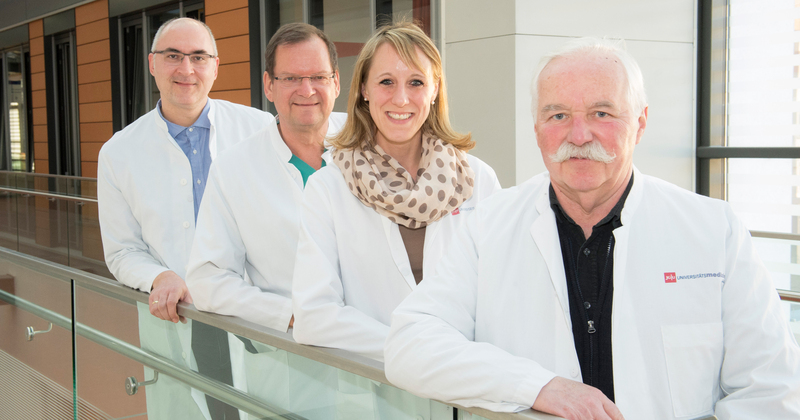 The study was financially supported by the Foundation Heart of Mainz and the Boehringer Ingelheim Foundation (project: New and Neglected Cardiovascular Risk Factors). 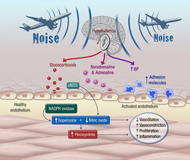 Simplified cartoon summarizing the mechanisms underlying aircraft noise-induced vascular damage. Noise causes stress along with increases in stresshormones such as adrenaline, noradrenaline and cortisone. These stresshormones activate the endothelium, which increases its permeability for inflammatory cells. Simultaneously there is an activation of two superoxide producing enzymes such as the NADPH oxidase and an uncoupled nitric oxide (NO) synthase, which produce large amounts of free radicals. As a consequence we see less vasodilation, more vasoconstriction, more proliferation and more inflammation, all of which will initiate or perpetuate the atherosclerotic process.